Umar Hasfizal 19 years old, lives in Kuala Lumpur, Malaysia. He was diagnosed with AUTISM when he was 2 years old. Since then, he attended early intervention program and had shown impressive development for an autistic kid. Umar has a rare musical talent especially in singing. His voice often captures the hearts of his audience. He has participated in various singing competitions including The Malaysian Special Idol 2006 where he emerged as the 1st runner up. 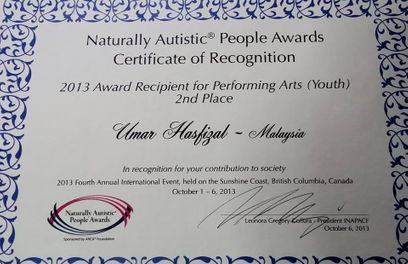 In 2013, Umar received an international recognition during the International Naturally Autistic People Awards Convention and Festival that was held in Canada where Umar won 2nd Place under the Performing Arts (Youth) category. 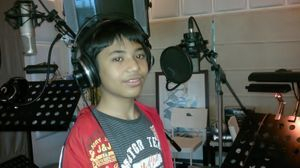 Umar often being invited by Corporates and Government Agencies to sing at various functions. He was also given the privileged to entertained the Royal Majesty Queen of Malaysia and also the Prime Minister’s wife. In mid of 2012, with the help of a kind composer, Mr Brian John Yim, Umar successfully launch his first mini album with the title I GIVE THE BEST OF ME featuring 2 songs. His effort was an inspiration to the community where Umar was invited to several TV programs to share his success story. On 9th May 2015, Umar's second album was launched during a charity performance organised by AUTISME MALAYSIA held at UNIVERSITI MALAYA. with the kind help of The Muhibbain, and special thanks to them. 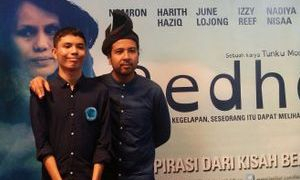 Umar was also given the opportunity to sing for the Original Sound Track (OST) of the movie titled REDHA.